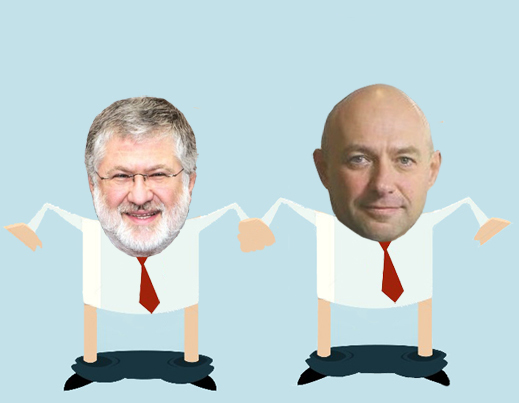 The Russian oil company Tatneft has launched a successful surprise attack in the UK High Court on the personal assets of Igor Kolomoisky (lead, left) and Gennady Bogolyubov (right). It is claiming $334 million in payment for crude oil Tatneft delivered in 2008 to a Ukrainian refinery which Tatneft controlled at the time. The two Ukrainian oligarchs subsequently took over the refinery with almost as much stealth as Tatneft’s retaliation in London. The details of the case are being kept secret by Tatneft and the London lawyers for all sides. The case became public at a High Court hearing late last week when the court sustained a freeze order against Kolomoisky’s and Bogolyubov’s worldwide assets. This had been imposed on March 22, catching the two men unprepared. Kolomoisky lives in Geneva on a temporary residency permit; Bogolyubov lives in London. The High Court order limits ATM withdrawals for their personal expenses and transfers from their bank accounts to £5,000 per week. Tatneft is a London and Moscow-listed oil company controlled by the Tatarstan Republic of Russia, which holds 36% of the issued shares, plus a controlling golden share. Ostensibly, the free-float of the company is the remainder of the share issue. However, a filing by Tatneft to the US Securities and Exchange Commission revealed in 2005 that blocs of Tatneft shares are also controlled through subsidiaries of the parent company and by other related-interest schemes concealed from the company’s public reports. Revealed by this report on recent share operations by the principal independent stakeholders is a traded free-float of less than 5% of the company’s stock. The Bloomberg charts confirm daily turnover volumes are minuscule. The current market capitalization of Tatneft is $11.5 billion. According to its latest report for 2015, Tatneft’s oil output was up last year by almost 3% to 531,800 barrels a day, plus 15,500 barrels of oil equivalent (boe) of gas. 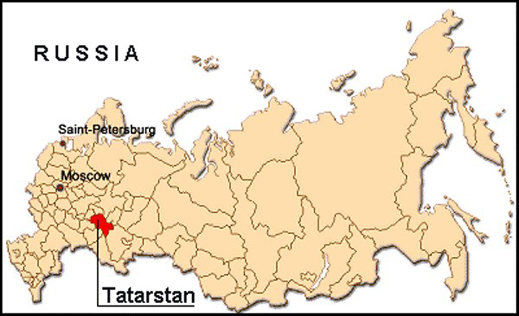 Almost all of the oil and gas comes from fields in Tatarstan. The company reports its 2015 sales revenues were up 16% to Rb552.7 billion; earnings (Ebitda), up 22% to Rb128 billion; profit, up 7.3% to Rb98.9 billion. 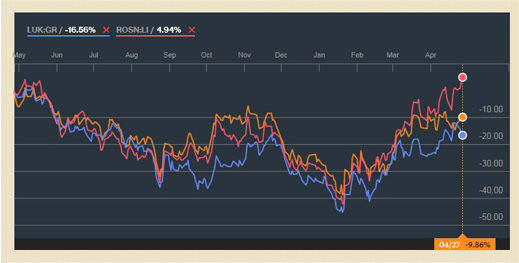 In London stock market sentiment towards Tatneft has been less positive than towards Rosneft but more positive than for LUKoil. On April 21, a month after Tatneft had struck in the High Court, the company tipped off the Moscow wire service Interfax with a precis of its claim against Kolomoisky, Bogolyubov and two other Ukrainians, Pavel Ovcharenko and Alexander Yaroslavsky. The Russian business press followed without adding details or asking questions. 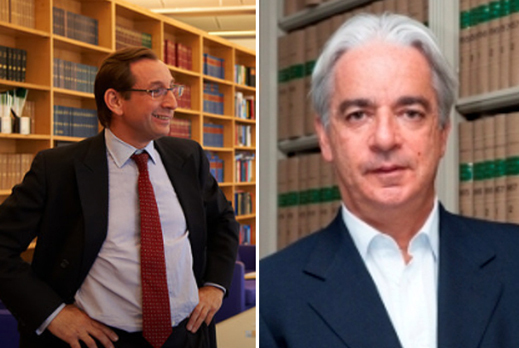 On April 22, Bloomberg was in court to hear lawyers for Kolomoisky and Bogolyubov fail in their bid to remove the freeze order against their assets. The assets which have been frozen include Kolomoisky’s home in northern France, across the border from Geneva (below, left); Bogolyubov’s home in Belgrave Square, London (right); boats, planes, and bank accounts. Apparently untouched are Kolomoisky’s property in Geneva, where he holds a temporary Swiss residency permit under current review; a house in Israel ; and commercial properties in the US. For more on the Kolomoisky inventory, read this. Yesterday Tatneft’s spokesman in Almetyevsk, Nuriya Valeeva, was asked for a copy of the London court papers setting out the company’s claim. She referred the request to the company’s Russian lawyers. They have not responded. Tatneft’s advocate in London is Richard Millett QC (below, left). He refused to answer questions about the case. He also refused to identify his instructing solicitor. The solicitor representing Bogolyubov, David Kavanagh of Skadden Arps, has not responded to email and telephone requests. 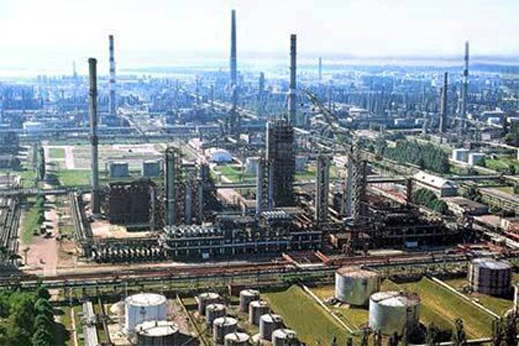 From Tatneft’s annual reports it is possible to piece together the claim, starting in 2005 when Tatneft’s control of the Kremenchug refinery – the largest in Ukraine (pictured below) — and of UkrTatNafta, the refinery company, was first challenged by Ukrainian government officials. By 2007 the Ukrainians had succeeded in reversing Tatneft’s share purchases, and then ousting Tatneft appointees from operational control of the company. As they did this, they stopped paying for the crude Tatneft supplyied to Kremenchug for refining. According to Tatneft’s report for 2009, the amount owed by the refinery company for the Tatneft crude oil deliveries was $334.3 million. That appears to correspond to the claim now in the London court. Tatneft reported in its directors’ report for 2013 that “as a consequence of the forcible takeover of Ukrtatnafta and seizure of shares of the Group in Ukrtatnafta”, it was doubling its compensation claim from $1.1 billion to $2.4 billion. The Paris arbitration court judgement was issued in July 2014. Tatneft won, but was awarded only a tiny fraction of the capital loss, and that was immediately contested in the Paris Court of Appeal. Because the appeal has not been decided, the award hasn’t been paid by the refinery company. Instead of waiting to collect the smaller sum, the lawyers for Tatneft decided to go after the bigger one immediately; this is the old oil deliveries bill. Without disclosure of the London court papers it is not possible to report how Tatneft has substantiated Kolomoisky’s and Bogolyubov’s interests in the refinery company in order to justify freezing enough of their money to cover their potential liability for Kremenchug’s debts. Reported to control Kremenchug through their Privat group’s 42% stake in Ukrnafta, the refinery’s parent, their connexion appears to have been judged by the Paris arbitration court ruling, though that too remains inaccessible. It also appears the new claim amount identified in the High Court last Friday, $334 million, is equal to the old one. The last time Kolomoisky’s reputation as a raider was tested in the UK courts, he won; for the details, click to open. 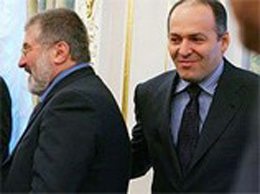 This time, however, Tatneft’s lawyers have calculated that he and Bogolyubov are as susceptible to an out of court settlement as they proved to be, when they settled with Victor Pinchuk (right) on the High Court steps in January; almost three years after Pinchuk filed his lawsuit. For more details of that case, click. That settlement cost Kolomoisky and Bogolyubov about $500 million. Another $334 million won’t be easy to stump up quickly. The penalty of delay will register, however, every time they go to the ATM.